Thanks! I thought people would like this! I really think it is cool but needs to be spell checked, and you need to cut things out so it makes logical sense. Also, please make instructions or pictures of all the origami mentioned in these storys. I told you, I would make rivisions. I’m spell-checking it right now. It will be up soon. I really haven’t followed any stories quite yet, but I may start reading these, thjey’re pretty interesting. How do middle schoolers build a giant shredder? Did they call phineas and ferb? Lol, I could see “Origami Phineas and Fold” being a funny story! Perry the Paperpus! Who’s with me?!? I AM!!!!! I LOVE THE SHOW AND THE TV MOVIE!!!!!!!!!!!!!!!!!! Names:Dr.Doofoldshmirtz.Major Monogami. Agent P. Perry the Paperpus. Phinicrease. Ferbigami. Phinicrease and Ferbigami. Ooh, that is a good idea! Oh, one more thing, BEST. STORY. EVER!!!!! i remember that from TSCOOY!!!!! I have never read part two, but I really like it. Mind If I write a story with you, Evil Jawa, Megan/Phred and me as the main characters? Just for anyone who loves marvel as well as Phineas and Ferb there are going to be two specials with them. 1. Phineas and Ferb: Mission Marvel (crossover with Spider-Man, Iron Man, Hulk, and Thor)! 2. Theater movie of Phineas and Ferb!!!! if you get the others permission then yes! Cool! I’ll ask JC and EJ! But when can we expect the story? Darth Noah, when can all of us expect the story? I can’t wait to read it! You might be able to join. It’s nice to see a lot of people getting together for a project. Hey when is the “go help the brown haired kid” going to be finished? Is it finished? Cuz if it isn’t… FINISH IT!!!!!!! AWESOMEST STORY EVER!!!!!!!!!! What was the inspiration for Papertine and Jacob Minch. guys! I MET THIS KID NAMED JACOB AND HE WAS MEAN…. Origami Plo-Koon: What the wha? Origami Boba: Zombie, quit being weird and get your deadness in the cargo hold. Origami (VERY creepy wearing santa hat) Skeleton: Weee! We wish you a merry Crease-mas we wish you a merry crease-mas we wish you a merry Crease-mas and a happy new Fold! Well, JohnF wrote the original story, and he created the original character and story! I once asked him if I may have the honor of creating Jacob’s backstory, which you now see in the series. 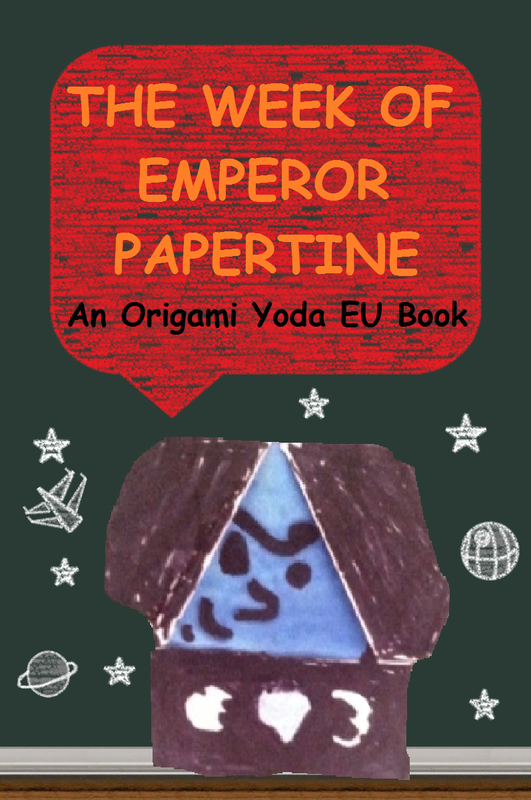 The choice for Emperor Papertine, well, may have been due to the first OY EU story, which featured Papertine as the main antagonist, but wielded by Dwight! So…. Is this going to be non canon now? With the release of Emporer Pickletine rides the bus, this might end up non canon. Harvey doesn’t seem like the guy who would want to copy another person’s idea. Notice how you ca kind of make your Papertine into a Princess Lablemaker? superfoled jhonF is also a super writer!